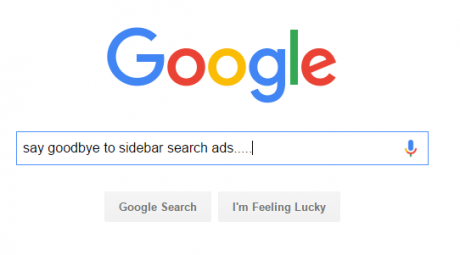 Late last week, Google confirmed that it will stop showing ads on the right side of desktop search results and will only place ads at the top and/or bottom of the search results page. Some will say this change is long overdue and will argue that the sidebar ads had terrible conversion rates anyway and saw a very low ROI. Others speculate that they are doing so to match the mobile version, and that basically all Google search results will now look like Google’s mobile results. First, let’s get the facts. 3) THREE text ads will be displayed at the bottom below the organic listings. 5) Product listing ads and Knowledge Graphs will continue to display in the right side on relevant search queries. How Does This Affect Your Business & Marketing Efforts? 1) Due to the lesser amount of ads slots available, it will be a bigger fight for the top. Many are predicting that a fewer number of ads will lead to increased cost per click (CPC) due to supply and demand of these now highly important ad slots. 2) If your cost per click (CPC) is not competitive, you can expect to be pushed to the bottom of the first page, or even worse, the second page – which will result in a drastically lower number of impressions. 3) Campaigns that are focused on bid-to-position strategies will need to make updates to adjust. That alone may cause auction cost patterns to drastically change initially as PPC managers react to one another’s adjustments fighting to the top. As this change is still very new, our PPC team here is very interested to see how the battle for first page and top of page bid will play out. Stay tuned for more updates as we continue to get more insights about this change.